Perfect for corner curtain rod installation. Unassembled set includes track with one 90 degree bend, 9616 carriers, 9610 end stops and 9611 pull out. More than one bend is an additional charge. Can be bent approximately 12" and 14" radius or circular curved 48" radius minimum. Creating: Add 30 percent to rod before bending charge. Minimum and maximum crating charges. For quoting purposes, identical rods may be packed approximately 15 per case. Maximum set length for ceiling mount, two way draw is 40 feet. Recessed on way draw maximum 20 feet Wall suspended, multiple draw 40 feet. Plus truck freight over 104". Base price is for first three feet. Double bay window curtain rod set by Kirsch. Includes brackets for the corners and ends. Bay window drapery rods for simple installation of light weight curtains. Lockseam construction,double rod for two sets of curtains or a curtain with a valance. Sides 18" to 42", center 36" to 63". Clearance 2 inches. See other corner and bay window solutions below. 4-711-1: Bay window curtain rod set 20-42" sides, 38-64"center 2 1/2 "
Empire bracket for wood curtain rods 2 1/4" diameter. 2 1/2" wide by 9 3/4" high by 6" deep, 3" projection. Price unit, each. Old World elegance that adds warmth and character to modern day interiors. Somerset by Paris Texas Hardware. Quick ship program. Fluted rod plain slides 100-180"
Choose from a broad selection of lush metal finishes, wood grains and popular paints. Baton draw curtain rod, 31 slides, projects 2 3/4 to 4 1/4 inches with a clearance of 2 to 3 1/2 inches. Baton is 33 inches. White finish. Graber heavy duty features include a universal front loading end bracket, a spring loaded side gate for adding or removing slides, molded, canted slides, can be converted to one way draw, scored center support base for easy mounting on narrow casings, universal cam lock stirrup, braided polyester cord, and angled tip on overlap arm. Resin valencia finial for Select Wood 1 3/8" diameter wooden curtain rods. 4 3/8" L x 2 1/2" H. Note: Some colors are more and will display price in cart. Tube curtain rod bracket 1 1/2 inch projection for ceiling mount 1 inch metal pole. 2 5/8 inch diameter by 2 3/8 inch deep. Some colors are more than base price. Adjustable curtain rod. Complete set Includes 42 rings, brackets and finial. Clearance 2 1/2" to 3 1/2", return 3 1/2" to 4 1/2". Rods are metal, finial and slides are plastic. Recess bracket for 3/4" curtain rods. Great for corner windows or bay windows. Black gold rust iron collection by Gifer. Available in three colors, black, black gold, black rust. Use for corner curtain rods or bay curtain rods. Connect two Studio Coordinate rods together in corner or bay window. Nice solution for corner or bay window where you need a decorative traverse rod. 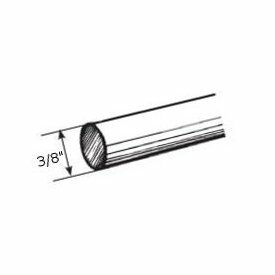 51444c-110: 1-3/8" cirmosa smooth decorative traverse rod 38-66"
Made of vinyl coated fiberglass yarns. 3 percent openness factor makes this roman shade fabric perfect for windows that require more privacy. Comes in 63 and 98 inch wide fabric. Available in cut yardage or 30 yard bolts.